Although central to Alzheimer's disease, the toxicity of Aβ remained poorly understood. Researchers at the Institute of Chemistry and Biology of membranes and nanoobjects (CBMN, CNRS / University of Bordeaux / Bordeaux INP) and the Universities of Freiburg and Leuven have used a yeast model system to demonstrate that Aß targets the plasma membranes of cells. This work, published in the journal Frontiers in Molecular Neuroscience, should help control, and especially reduce, these toxic interactions. Alzheimer's disease is characterized by the aggregation of amyloid beta (Aβ) inside and outside the neurons, leading to the formation of large amyloid plaques. Understanding the action of this peptide is therefore a crucial step in the study of this pathology. 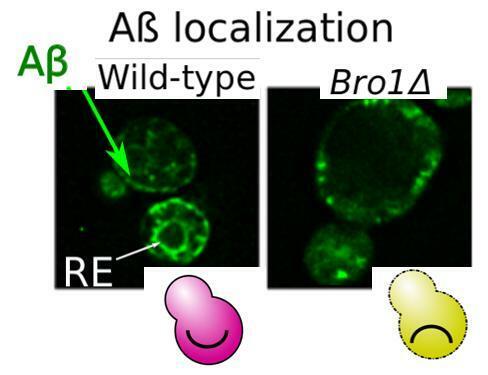 For this purpose, scientists from the Institute of Chemistry and Biology of membranes and nanoobjects (CBMN, CNRS / University of Bordeaux / Bordeaux INP) and Universities of Freiburg and Leuven have monitored the toxicity of Aß on a simple eukaryotic model. The model chosen, S. cerevisiae, indeed has a large number of genes in common with humans and is a convenient platform to study the molecular processes that are related to complex diseases. 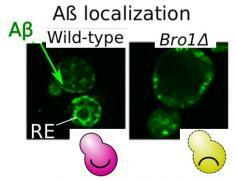 Researchers have shown that cells can manage Aß accumulation in their endoplasmic reticulum, a membrane structure intermediate between the nucleus and the outer membrane. They then challenged the toxicity of Aß with a library of knockout yeasts spanning the entire genome. They could identify KO strains that could no longer compensate for the damage caused by Aβ (which then accumulated on the plasma membrane) and exhibited a drastic increase in peptide toxicity. It is thus problems of expression of the protective and repairing genes of the plasma membrane that influence the cellular toxicity of Aβ. The BRO1 gene, whose human equivalent is Alix (encoding for a protein found in amyloid plaques), is thus particularly important for protecting cells. This finding opens plethora of questions, and researchers can now study these biochemical interactions in the hope of controlling the deleterious effects. The impact of ESCRT-III on amyloid ß1-42 mediated membrane lesions in a humanized yeast model.